When you think of casinos you think of bright lights, fun music, the sounds of slot machines and lots of exciting atmosphere. Hosting a casino theme party can be a lot of fun but it needs to be planned and executed effectively in order to ensure your guests have a great time. Send out your casino-themed party invitations and let your guests know whether you have planned a night where everyone is required to dress up in all their glitz and glamour outfits or whether it will be a more laid back come-as-you-are type of casino night party. 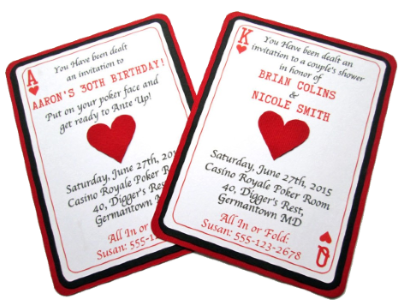 You can choose to purchase casino-themed invitations or if you want to make your own grab a pack of playing cards and glue your party date, time and location onto the back. A good casino theme party must have the right atmosphere. Use casino-themed party decorations to turn your venue into a replica of a real Las Vegas casino. You can use poker chips, playing cards and dice as part of your décor. The use of black and red in your choice of decorative touches, as used on playing cards, is a great way to obtain that casino atmosphere. No casino theme party would be complete without games but if you live in a state in which gambling is illegal bear that in mind. It doesn’t mean your guests can’t have a lot of fun though. The fun and excitement of playing casino games is in trying to win. You can hire roulette wheels, poker and blackjack tables and most any other types of games that will help give your party a real Las Vegas casino feel. Playing for fake money is one way to make your guests feel like they are actually gaining something by playing. When the night is coming to an end that fake money can be traded for non-monetary prizes. Prizes could include things such as chocolates, bottles of wine, movie tickets and the like. Typically people at a casino night prefer ‘finger foods’ that they can wander by the food table and make a quick selection before moving onto their next game. Drinks should be in plentiful supply and readily available too. Offer a good variety of non-alcoholic drinks as well as alcoholic. A casino theme party can become expensive if you don’t keep a fairly tight rein on your budget. When planning any party it is always wise to go into the planning with a clear budget in mind and then work within it to get the maximum ‘bang for your buck’. A casino theme party done well doesn’t necessarily mean you have to ‘break the bank’. Remember the purpose of the party is for everyone to get together and have fun.